An Iraqi-born man once held as a terror suspect has been stripped of his UK citizenship for a second time, even though judges ruled it was illegal to make him stateless. The home secretary's move came as she appealed against a Supreme Court decision in favour of Hilal Al-Jedda. Mr Al-Jedda lost his Iraqi nationality when given UK asylum in 2000. He became British and was first deprived of his citizenship in 2007, leading to a series of legal appeals. Mr Al-Jedda, who is in his 50s and is now living in Turkey, was arrested by US forces in Iraq in October 2004. He was transferred into UK custody and held without charge for three years. Then Labour Home Secretary Jacqui Smith took away Mr Al-Jedda's UK nationality shortly before he was released, but a subsequent High Court case saw him win back his citizenship. 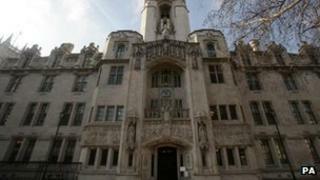 The government appealed against the decision, leading to October's Supreme Court ruling. Lawyers for Hilal al-Jedda have now confirmed Home Secretary Theresa May had issued a second "deprivation order" against him and that they had lodged an appeal. Tessa Gregory, who represents Mr al-Jedda, said the Home Office alleged he was "committed to Islamist extremism and associated with Islamist extremists".